Nice, huh. A beautiful Pogo daily from 1951 by Walt Kelly. Despite all that fine brushwork, Kelly worked pretty small--that original is only 17.5" x 6" with the strip itself 16.5" x 4.75". If you look closely, you can see Kelly's underdrawing. He uses blue pencil which would disappear in the photographic process for making the strip print-ready. His blue pencil drawing is very tight, except (curiously) on the lettering and (less curiously) on Porky Pine. But what is amazing is not his pencils but his inks. Not a single correction on the page. What an amazingly skilled brush-handler he was! It's freaky that a guy who was such a brilliant writer and satirist should also be such a skilled artist--but that combination describes many (but not all) of the greatest cartoonists, of whom Kelly is one of the very top ever. 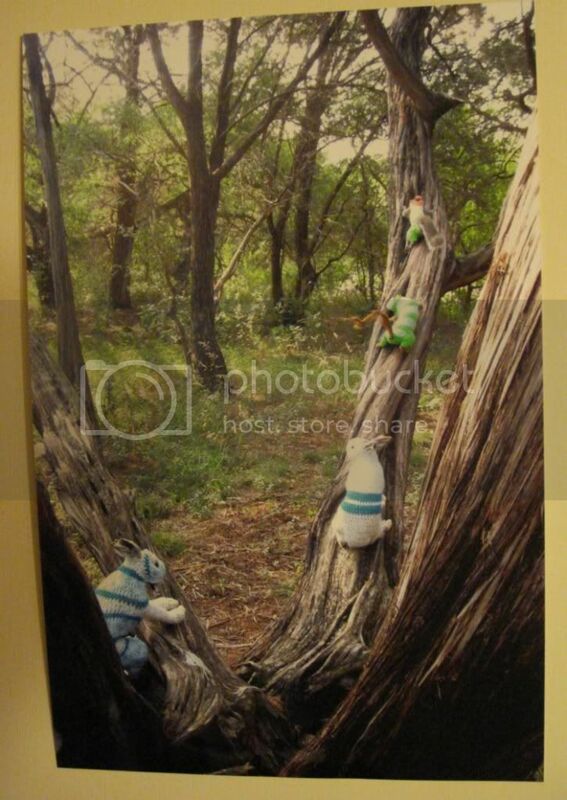 This photograph is "Untitled from Rabbits in the Land of Squirrels" by Elaine Bradford. If you are from Houston, you might have seen her recent show at the Art League called the Museum of Unnatural History. This show was half Museum of Jurassic Technology and half knitting. I understand a fake museum--museums are so central to art in our day that basic postmodern theory practically demands that artists create pastiches and parodies of museums. You see it in David Wilson's and Hans Haacke's work, among others. It's a form of conceptual art, but it involves a lot of precise craft. Likewise knitting. Knitting is kind of a new thing in art. I don't know what it means. Maybe Bradford can enlighten us a little with some words from her own website. Through crocheting sweaters for inanimate objects, she references connotations associated with the handmade, and personal ideas of comfort and warmth. These ideas about the process of crocheting are juxtaposed with the absurdity of its application. She has covered a variety of items in handmade sweaters, including trees, vacuum cleaners, and groceries. Her most recent work involves crocheting sweaters for taxidermied animals. So OK. I thought it may refer to early feminist artwork that often used traditionally female artforms (like sewing) and wrenched it into the man's man's man's world of contemporary fine art. This was one of the pieces for sale for either $50 or $100 at theApama Mackey Gallery. This was a one-day show called the "The AMG Visual Stimulus Package" that was co-sponsored by Houston video site, Keep Houston Rich. Anyway, I bought these two pieces of art, adding them to my "collection," such as it is.